The Quarterly is the official magazine of the RCMP Veterans’ Association. Its origin stems from the activities and accomplishments of the Force which have and continue to be inextricably interwoven with the development of Canada. Since its early beginnings and even today, the Quarterly is intended to display the wealth of tradition, history and stories of the RCMP. In October 1999, the RCMP Veterans’ Association assumed publication of the Quarterly from the Force to ensure its continued success and enjoyment by all readers. Now more than ever, the Veterans’ Association recognizes the importance of communication. The Quarterly offers the RCMP, its current and former members and interested contributors a chance to keep in touch and to share information on programs, events and stories. 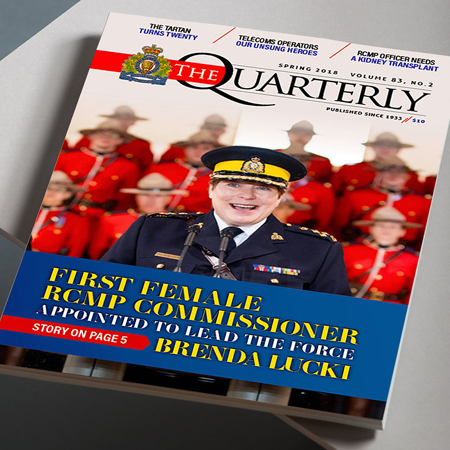 The Quarterly welcomes manuscripts, letters, photographs and news on RCMP and RCMP Veterans’ Association related subjects in either official language. Text should be simply formatted and saved electronically (e.g. WordPerfect or Microsoft Word). Submissions will also be accepted as hard copy only, typed double-spaced on one side of the page. Any material accepted is subject to revision and editing at the editor’s discretion.